Due to recurring problems with email please call to talk to Terry, 970-568-7585. PLEASE NOTE: This telephone number is a LAND LINE, and CANNOT RECEIVE TEXTS. Please do not attempt to text this phone number. Please call to speak to Terry, or please send an email. You may send email to arriniranch@aol.com. If no response in 24 hours please call. 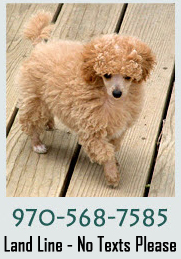 Thank you for your interest in Powder Valley Poodles! Please read Our Policies and Frequently Asked Questions. Please note that this facility is a WORKING CATTLE RANCH as well as a breeding kennel of the finest dogs on the planet. We have mother cows with calves and BULLS. The fences are bull-proof but the dogs can easily get in. Our dogs do not EVER go in the cattle pens. They know better. Your dogs do not. Bulls, and mama cows and dogs DO NOT MIX. PLEASE — for your pet’s safety DO NOT BRING your dog onto the property. Keep it in the car. If it is necessary for your dog to be out of the vehicle (say, at Terry’s request to see the dog) HAVE IT ON A SHORT leash. Even if it just prevents your dog from rolling in fresh cow plop — you and your dog — will be much better off. Puppies are shown by appointment only. Please call ahead. We can usually be available that day or the next day if we know that you are coming. Gates are kept locked for the safety of our animals and guests. Our phone number is 970-568-7585. No texts will come through on this line. Our address is 506 West County Road 84, Wellington, CO, 80549. IMPORTANT! Entering our address in your electronic device usually sends you to our neighbor. Remember: The number “506” is on the mailbox on the road in front of the house AND — more importantly — our house is a SMALL LOG HOUSE WITH GREEN TRIM AND GREEN SHEDS FOR THE LIVESTOCK. IT IS NOT A WHITE HOUSE. If you are in a driveway with a bunch of trees next to you or driving on a driveway towards a white house YOU ARE AT THE WRONG PLACE. I suggest just following our directions written here. It will be the fastest, easiest way to get here. Take I-25 north to exit number 288. This exit is also called Buckeye Road. Go west on Buckeye (also called County Road 82) about six miles to the stop sign (County Road 15). Turn right on County Road 15 ( also called Terry Lakes Rd.) and go EXACTLY one and one half miles ALWAYS BEARING LEFT. This automatically puts you on the correct road and right in front of the house. The house number is 506. It is a little log house with green trim and green outbuildings for the livestock. Take I-25 south to exit number 288. This is the second Colorado exit. It is also called both CR 82 and Buckeye Road. Go west on Buckeye about six miles to the stop sign (County road 15). (also called Terry Lakes Rd.) Turn right on County Road 15 and go EXACTLY one and one half miles to the ranch ALWAYS BEARING LEFT. The house number is 506. It is a small log house with green trim and green outbuildings for the livestock..
Go north on College past Old Town to the stop light at Terry Lakes Rd/Highway 1. Go north on Terry Lakes Rd/ HWY 1 . At the “Waverly Y” go towards Waverly (County Road 15) instead of Wellington. This means you must turn left onto 15. Go north on 15, “forever,” Eventually the road you are on becomes a dirt road. At the point that it becomes dirt, look at your odometer and go EXACTLY one and one half miles ALWAYS BEARING LEFT. This puts you right in front of the ranch. It is a small log house with green trim and green outbuildings for the livestock. The street number is 506.